Dotted among the tropical gardens—open-air cafés, small pool enclaves and fresh fruit oases are yours to discover. Never crowded or hurried, the resort offers an intimate tranquility and when desired, total seclusion. 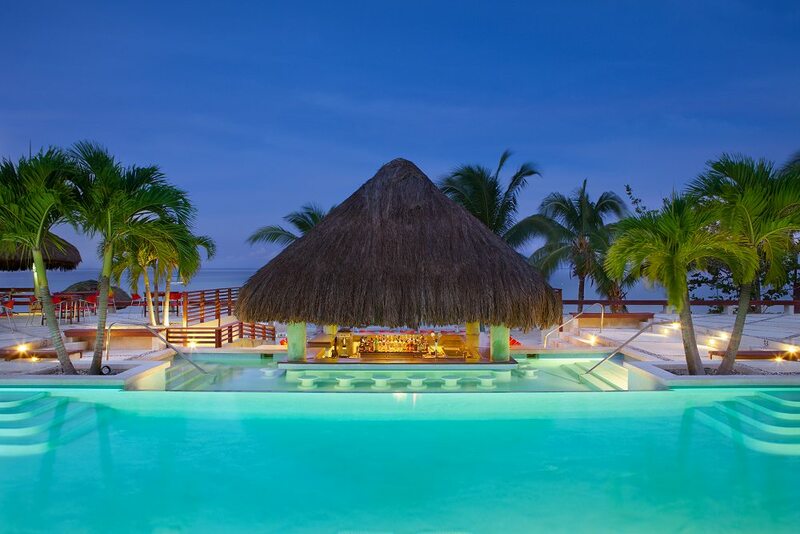 Immediately upon arriving at Couples Swept Away, you’ll know you’ve arrived in your own corner of paradise. Never crowded or rushed, this all-inclusive luxury oceanfront resort in Negril offers intimate tranquility and when desired, total seclusion. Explore seven miles of pure white sand, savor island cuisine in an open-air café, and surrender your stress in a spa dedicated to relaxation. Let Couples Swept Away capture our heart and soothe your soul. Pros: This resort is on the perfect stretch of the most beautiful beach in Jamaica. It is a local resort, only in Jamaica not a big chain. The rooms are very basic caribbean, nothing close to the Sandals resorts. The food is good and just like sandals they have non motorized water sports included. They also include a Free Catamaran ride and snorkel to Ricks Cafe to watch the cliff jumpers, which is a pretty good deal. I priced an Ocean View Suite for $4020.00 They have a golf course and golf is included! I have seen Many many weddings here, it is a very popular spot for them. Cons: The beach is public so you will have people walking up and down the beach and vendors trying to sell you things. They cannot come up above a certain point so they will not bother you if you are just sitting there but if you want to walk down the beach, they will ask you if you want to buy this or that..Just say no and they are fine. It is part of the experience and I personally love it, but it is not for everyone. Pros: This resort is on the perfect stretch of the most beautiful beach in Jamaica. It is a local resort, only in Jamaica not a big chain. The rooms are very basic caribbean, nothing close to the Sandals resorts. The food is good and just like sandals they have non motorized water sports included. They also include a Free Catamaran ride and snorkel to Ricks Cafe to watch the cliff jumpers, which is a pretty good deal. They have a golf course and golf is included I have seen Many many weddings here, it is a very popular spot for them. Pros: We have been all over Jamaica, little over 25 different times. Couples Swept Away has been our favorite for years. The rooms and resort has a Caribbean feel. The staff is outstanding for the friendliness. The rooms have king beds, so king beds never sell out! One of the best beaches in the Caribbean, soft and white for miles. Sport complex has plenty for the health enthusiast. We love the path ways through the gardens. If you want a more real Caribbean experience vs a modern new high rise you will be Swept Away too! Cons: We eat too much, all the food is excellent! A few pesky sales people on the beach, recently new law said sales must stay at the edge of the water, which has helped.